An amazing number of operators are injured when getting on and off their forklift. Slips, trips and falls are still one of the most common causes of workplace accidents. 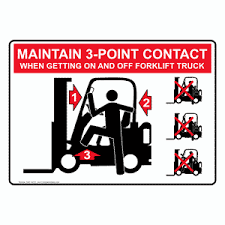 So here is the rule: use 3 points of contact mounting or dismounting the forklift – this means either two hands and one foot, or one hand and both feet, to form a triangle of anchor points that help improve stability and reduce the risk of falling. Never jump off! This is a simple way to avoid injury and it only takes seconds to do this correctly. We always talk about this in our on site forklift operator training programs.